Tennis elbow, also called lateral epicondylitis, is a painful state where the tendon is inflamed on the outer segment of the elbow. Pain and tenderness in the bony knob on the outside of the elbow are the main symptoms of tennis elbow. Pain may radiate into the upper or lower arm. You feel pain while shaking hands, lifting something, gripping something, making a fist, opening doors and windows, raising the hand and straightening the wrist. The movement of elbow, wrist and fingers is facilitated by the muscles surrounding the elbow joint. The tendons in the elbow join the bones and muscles together; they control the muscles of the forearm. Tennis elbow is an injury caused by overuse of the muscles attached to the elbow; muscles that are used to straighten the wrist. It is caused by playing sports like tennis, weightlifting, squash, racquetball and fencing. Tennis elbow is also caused by activities like playing violin, typing, carpentry, raking, painting and knitting; any activity that places repeated stress on the elbow joint can cause tennis elbow. The good news is that tennis elbow can be treated successfully. Resting the tendon is the most important part of the treatment. It is very important to avoid any aggravating activity during treatment. Rest facilitates healing of small tears in the tendon. Duration of rest depends on severity of the condition; your doctor may ask you to rest your tendon for weeks, or sometimes even for months. When it comes to tennis elbow treatment, surgery is the last resort. Treatment is most effective when it begins as soon as symptoms appear. You may treat your tennis elbow by taking appropriate steps to reduce pain. As soon as you experience pain, use ice packs for 10 to 15 minutes at a time. Do it several times during the day. Put a thin cloth between your skin and ice. Continue this treatment till you get relief from pain. You may also use warm, moist cloth. Hot baths also work. NSAIDs like ibuprofen, aspirin and naproxen are known to be effective against tennis elbow. Acetaminophen is also works well against pain. You may rub NSAID cream over the painful area. Before taking any medicine read the instructions carefully, and more important, follow them. If you are below 20 years, do not take aspirin. 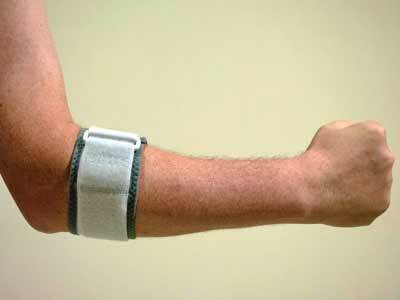 Sometimes doctors use wrist and elbow splits to treat tennis elbow. Even though splits help other bone, joint and tendon problems, they are not very effective against tennis elbow. What can a massage therapist do? Applying a remedial massage can help release the tightness of the extensor muscles and the muscles sorrounding the elbow. This massage technique will stretch and loosen the muscles affected which will help improve blood circulation that will stimulate a faster recovery. How to prevent tennis elbow? It is possible to reduce the risk of tennis elbow substantially. Keep your forearms strong by exercising regularly, under the guidance of an expert. If you play sports that involve repetitive movements, seek professional help to ensure that you do not get tennis elbow. Avoid using your wrist and elbow more than the rest of your arm. It is a good idea to spread the load to larger muscles in the upper arm and the shoulder. Before playing sports like tennis, gently stretch your arm muscles to prepare them for the task. Use lightweight racquets. Tennis elbow can be cured completely. You only need to consult your doctor as soon as to experience symptoms. Delay will only complicate matters unnecessarily.